As you can see, not only do the PGA Tour players generate better club and ball speed numbers, but their other numbers are more optimal. While the PGA Tour guys standout for their superior efficiency rankings, it’s neat to see that the Super Sr. players actually beat out the Sr. Am players. Essentially, the faster you swing, the lower the launch angle can be for optimal performance. For PGA Tour players, the optimum launch angle is usually between 11-14*. I remember the player that dominated total distance and carry efficiencies in 2009 was Darron Stiles, who had a 108 clubhead speed and a launch angle of 15*. Nobody else that season was above 14.1* of launch. Still, Miles is right. The guys in the amateurs here have drivers that are nowhere near fit for optimal performance. Here are the Enlow grips. As you can see, they are huge, dwarfing the clubshaft. Some of the new Edel Wedges. They have some crazy grinds available. Karakal grips. Again, a very good feeling grip at an affordable price. The Bushnell hybrid. I stuck the 1600 Rangefinder behind it to show a comparison of just how much smaller the hybrid is. Here are the Scratch Golf 'Flatbacks.' These are the irons that you can create pretty much any design you want. They can be more expensive than the Tour Department irons. A look down at the Scratch Golf SB-1 irons. Beautiful looking blade. One of the Bettinardi models. This model has that diamond/pixel looking insert along with some grooves. Great looking and feeling putter. New Foresight Sports launch monitor. As you can see, this is about the size of those old casette tape players. Puma tent on Demo Day. Place was blaring music and had a DJ with turn tables. Puma has some really nice stuff, but they need to get a 10.5" staff bag. Demo Day. I took a shot of the people on the opposite side of me. As you can see it is packed to the gills with Exhibitors and golfers. And it is that way the entire way around the OCN range. One note on Bushnell’s new hybrid GPS/Rangefinder, it already has 16,000 courses loaded onto the GPS. Furthermore, if your course is not loaded onto the GPS, you can still use the rangefinder to find the distances you want. Probably the ‘winner’ of this show for me was AimPoint Golf Technologies. Mark Sweeney, the inventor, was there and the amount of information he passed along to me was downright phenomenal and had plenty of things that floored this golfer who has been playing since he was 11 years old, played on scholarship, and currently plays to a +1 handicap. When I started working with the fall line, one thing I noticed is that It was almost impossible for me to get the ball to roll actually straight from the 12 o’clock position. It would usually ‘swerve’ around a bit and go in the cup, but it wasn’t straight. And then I would think I wasn’t on the fall line (which was actually true on many occasions as Mark explained to me, but that’s just another piece of information he told me that absolutely floored me). Fortunately, the Golf Channel had the PGA Tour on when we hit up Miller’s Ale House afterwards and with Mark being there, you’d be amazed at his ability to tell you how much putts were going to break with uncanny accuracy. How tough are Augusta’s greens to read? Why? Because almost all of the greens have one low point on them. So they are the easiest to read. The problem golfers have with their greens is when they don’t hit their approach shots close enough. Something I’ll go on about when the Masters comes around. ‘By far and away, St. Andrews.’ Because of the multiple low points on the greens and the low points that they will have in the middle of the greens. One thing for the sake of sanity of golfers, Sweeney stated that pin placements should never really be on a slope of greater than 3%. The only exceptions is if the greens are very slow, and even then it’s probably not advisable. So if you have an Exlys Breakmaster, 3% of slope is about 1.7*. I’ll be doing an experiment on this later on. I checked out GripMaster USA, but there was nothing really new there. They do have some exotic putter grips that some golfers may really like. Enlow Grips make some very unique style of grips. They are very oversized grips, but they told me that they were *not* made for the arthritic golfer, but for every golfer. They claim that the grips will allow for more clubhead speed and better control of the clubface. I didn’t try any out (they probably should’ve gotten a booth at the indoor hitting range area), but I know some of my readers prefer large grips. I tried some of the IOMIC grips. I think their regular grips are really nice. Very nice and tacky. However, I wasn’t very sold on their new cord grips. In fact, they felt noticeably less tacky. Lastly, I checked out the Karakal Grips and was quite impressed. Another big winner at the show was the HIRZL golf glove. I believe HIRZL started off making gloves for cyclists and have now stepped into the golfing array. This felt like the best golf glove I have ever worn and will be purchasing one before the Florida heat comes here in the spring. First ,the glove feels really nice. They are not ‘custom fit’, but they feel like a custom fit glove. They feel a bit rubbery, almost like what I would imagine a Spiderman costume would feel like. HIRZL’s claim is that rain and sweat will not effect their gloves. In fact, they had me hit a few balls with the glove on, then spray my glove with water and have me hit the ball again. And there was *no* slippage. And I didn’t even wipe my glove dry. HIRZL also told me that after 30 days, you can put the glove in the washer and you will now have a clean glove that is still as tacky as a new one. They also guarantee the gloves will last for 3 months. I couldn’t get a price from them, but it appears it’s around $30. But for a glove guaranteed to *work* and stay in tact for 3 months, you should be saving money in the end over buying a new glove every few weeks. I mentioned how much I liked the Oban shafts at the demo day. One thing that they mentioned to me is that a golfer cannot buy the shaft and install it themselves. They would need to go to a dealer, get fit and have the dealer install the shaft they need. I didn’t ask if Oban shafts will be an available option if one wanted to buy a new driver like the new Titleist drivers. But that could be a pitfall. Piretti putters had an impressive line of putters on display. Most of the designs were fairly standard, but the craftsmanship was impeccable. I got to putt with a few of the putters and found them to be extremely soft, but not spongy like you would see out of the White Hot Odyssey putters. They do offer quite a few custom options as far as grip, sight aligment lines and dots, lie angles and lofts. They can be found at www.pirettigolf.com. 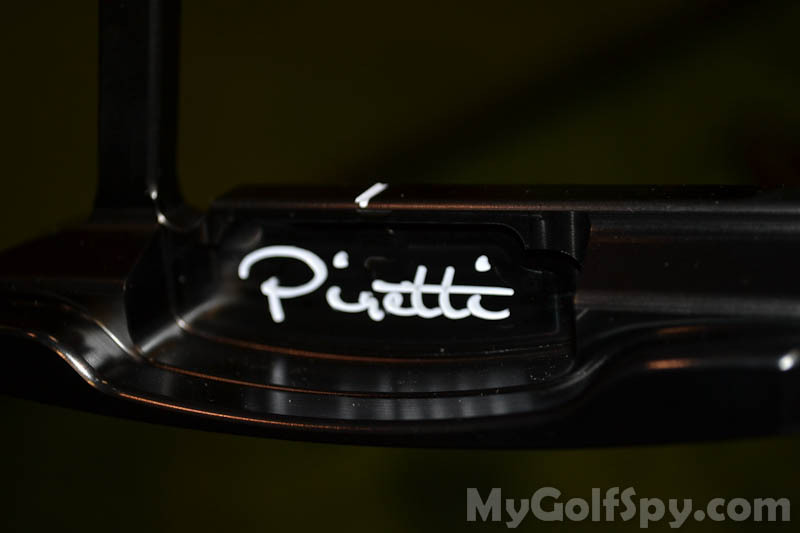 With the less endorsement money available on the PGA Tour, I think you’ll see more and more Piretti putters popping up on your TV screen. Fairway Pro– I was asked by several readers to check out any new indoor mat technology. The bad news is that there was only one real indoor mat surface I saw at the show. Everything else was geared towards outdoor hitting mats. The good news is that I got to try the Fairway Pro (www.fairwaypro.com) and it was excellent. This device is supposed to emulate the divot as the mat will move forward as you strike the ball. All in all, a great, fun show to go to. Afterwards a bunch of us like John Graham (www.johngrahamgolf.com), Dan Carraher (iteachgolf), Nick Clearwater, John Randall, Ralph Perez (Gotham Golf Blog), Mark Sweeney (www.aimpointgolf.com), John Dochety (www.lakewoodgcctullahoma.com), Claude Harmon III, Jamie Donadlson (AimPoint), Bobby Siravo (www.ifitgolf.com), and some others I unfortunately can’t remember went to Miller’s Ale House and had an excellent time talking about the game we love. I’d like to thank those guys for talking to ‘some blog guy’ like myself and thank Sherry Major for inviting me to the show and the PGA for doing such a top notch job of putting the event together. Day 2 was the actual first day of the PGA Merchandise Show. I’ll post pictures over the weekend. I’m starting to think the Orange County Convention Center is much bigger than Atlanta’s World Congress Center after getting lost trying to get to the shuttle that would take me back to my car which was parked in Timbuktu. The plan was to stay until 2 or so and then comeback for Friday and perhaps Saturday. But I soon decided I should just get everything I wanted to get in for the show and take Friday and the weekend off. Lots of similar type of people as with the Demo Day, some friendly, some very aloof. They do jump to the buyers who have an orange card. Not that I blame them, but if you’re a smaller company I would pay attention to somebody like myself who is on an editorial media pass because I’m the type of outlet that helps promote products which helps increase their popularity and net in more customers which will eventually draw in those big buyers. So if I have questions, don’t brush me off. At the show I got to meet up with John Graham, Lynn Blake, David Edel, Mark Sweeney, David Graham from the Faldo Institute (no, not *that* David Graham), Brian Manzella and Bobby Siravo. I met with the Bushnell people with their new ‘hybrid’ product. What this is a GPS and a rangefinder combined into one product. So let’s say a golfer is hitting their approach shot to the green, they can get a GPS reading to the middle of the green and then shoot at the flag stick with the rangefinder if they’d like. The hybrid is *tiny*. I’ll have a pic this week showing it in comparison to their 1600 rangefinder and it’s nearly ½ the size. They plan on adding Pinseeker technology which helps the golfer hit the target with the rangefinder. No slope edition in either, but they are planning on doing that. Spoke with the Scratch Golf people and the first question I asked them is with Trackman being able to measure attack angle, do they have any set guidelines with regards to measured attack angle and the grinds that a golfer can use. They do not have that and they said there are other variables as well such as what type of surface you play on, like somebody in the Texas hardpan probably will not want much bounce even if they do hit down on it quite a bit. I think it probably wouldn’t be a horrible idea to try and incorporate that grind to attack angle because it would give a ballpark and guideline for people. Scratch offers *3* different versions of irons…regular retail irons. ‘Tour Department.’ And ‘Flatback.’ I was told that the Retail will be much more customizeable soon because they are in the process of getting their forgings done from Japan to a place in Chicago (about time!) and the Japanese foundry would not allow for the finishes to be done. So once the transition to Chicago is complete, you can order a retail set of irons or wedges and get their ‘antique’ finish or chrome finish you desire. The real interesting irons were the ‘flatback’ irons which offer the ultimate in customization. Basically, for the most part, you can design your very own iron with the flatback. Let’s say you want some 1970 Hogan Bounce Sole 1+ designs, but made by Scratch, you can get exactly that. I asked about the hybrids and putters and they are pretty much getting away from that. Those were done mostly for loyal customers who wanted to ‘finish’ out their set. This took a long time because everybody and their mother wanted to talk to David Edel and Mark Sweeney. Funny enough, Edel has also come out with wedges and they are in part designed by famous golf instructor Mike Adams (of the LAWS golf instruction theory). Mike came right up to me and wanted to help, but I didn’t even recognize him. I have a lot of respect for Mike because while I have different philosophies on the golf swing, his instruction on the days when TGC used to do guest instructors all of the time, was stuff that I agreed with and I think was headed in the right direction. Kind of a quick overview, if you’re a righty and you aim right of the hole, it’s because you are using the front part of the blade to aim the putter with (that’s where your eyes are focused on). And if you aim left of the cup, you are using the back part of the putter to aim the putter. So if you aim too far right, you need to get a putter that gets your eyes to use the back part of the putter to ‘steer’ your aim more to the left and back towards the target. Eventually we worked and worked and worked to get a putter design that had me aiming correctly. The putter takes about 4 weeks to make and I’ll post up pictures when it’s done. But the head is more like a Ping B60 head, which is funny because when I was 14 years old, I had a Ping B61 that I made a lot of putts with and my dad was upset when I traded it in because he thought I putted great with it. Now we know why. The putter also has IIRC, 3 alignment lines in the back cavity of the club and an alignment dot on the top line. Edel offers just about every combination of alignment lines and dots possible. And yes, after talking to David I do believe my assertion that right handed golfers who are left eye dominant will likely aim right of the target, which is exactly what I have a problem with. After that, Edel fits the golfer with the weighting of the putter and the shaft flex as well. So it’s more than just alignment. Because I don’t use much wrist in my putting stroke, I need a softer shaft. I chose to not get the Vari-Loft because it’s basically set up to change the loft 1* from the golfer’s ‘base loft’ that they are fitted for. So if you are fitted with a loft of 4*, then you can get a Vari-Loft that can have lofts of 3*, 4* and 5*. I was thinking along the lines of a putter that could change from 1 to 6*, although I thought that I would probably stick with my ‘base loft’ most of the time. So I took the basic Edel putter design and got the Pixel insert which is designed so that as long as the ball hits the pixels, the feel of the putter and the roll of the ball will be the same. So you don’t have to hit the sweetspot dead perfect to get the roll and feel you want and it does feel quite nice as well. Today was 'demo day' at Orange County National. The above pic is the range at Orange County National which is gigantic and goes around in a circle and also has small putting greens throughout the range. The *entire* range is filled with exhibitors and allowing people to demo their products. I parked over at the Orange County Convention Center and took the shuttle from OCCC to OCN. The Convention Center is a good sized Convention Center. I'd say it's larger than Atlanta's World Congress Center, but it's probably not much bigger. As I walked ot register, I passed by the part where the actual Merchandise Show will be on Thursday thru Saturday. These people are working around the clock in order to get everything set up for tomorrow....not fun. The shuttle to OCN takes about 20 minutes and there are some complimentary goods like water, bag, etc. provided by some of the main sponsors. They also had plenty of food, drink and booze available as well. I wound up seeing George Hunt, John Dochety (aka Lake1926), Martin Chuck (inventor of the Tour Striker) and Brian Manzella as well and we talked for a bit. I'll try to go over the good stuff because I'm not here to totally knock stuff and the good stuff is the stuff I kept notes on. KBS - I've hit KBS shafts before, but have never hit their wedge shafts or their hybrid shafts. Very impressed with both the hybrid and the wedge shafts. I think if you're playing steel in your hybrids, it's definitely worth checking out. Very impressed with the Oban shafts. Hit Titleist's new driver with them and just smashed it with perfect trajectory. Graphite Design has a big winner with their new Tour AD shafts. Used them in a few drivers and hit them very hard and long. I also tried them in some hybrids and also hit them quite well. The MSRP is high (IIRC, $425), but the performance was excellent. Some other shafts I liked were the Project X Graphite Driver, Dynamic Gold Tour Issue and the Miyazaki shafts. Of course, this is hard to quite tell without Trackman measuring the data. Pure Grips have an installation method were it does not use tape and thus does not require solvent. One of the big advantages of this is that anybody can install these and install them anywhere. They felt nice and were tacky. They do not have a cord version, but they feel that if you use a towel and dry off the grip they will remain tacky. Lamkin - Lamkin has usually been my grip of choice. I got to try out their new 3GEN Perma-Wraps and they didn't disappoint. Lamkin claims that if they get wet and are dried, they actually get tackier. Titleist - I'd like to get a little more info on these drivers, but they felt great and I crushed every shot I hit with them. Can't complain there. Obviously, this was a major hit with the crowd. I struggled a bit with hitting it accurately, although the winds were blowing about 25-30 mph (it was funny going around in the circle because on one spot everybody would be hitting hooks and then on the opposite side everybody was hitting slices. I liked the feel of this club and if you put one of those Graphite Design or Oban shafts in there I'd be happy with it. But god would it look ugly. The thing with drivers is that you need to get this on Trackman as well. I knew quite a few people who got the R9 and liked everything about it except for the fact that they lost about 10 yards with it. 1. the ones who are just there and you need to come to them with questions and they probably won't answer them or give you short, curt answers. Keith was the best one of the bunch. Unfortunately, the KBS people fit into the first 2 types. The Wilson Staff people were very nice and helpful to talk to. 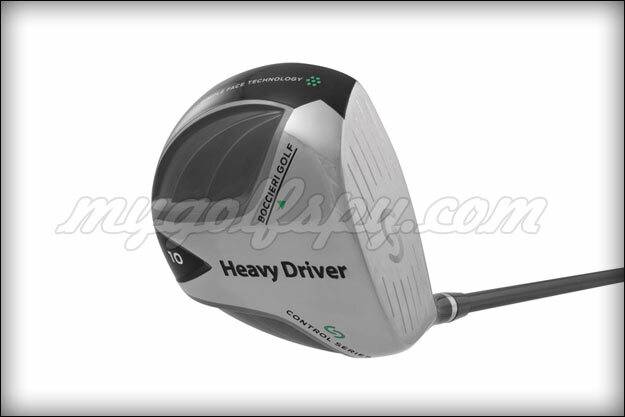 Anyway, the Heavy Driver isn't really a heavy driver. The weight is more balanced throughout the entire club. 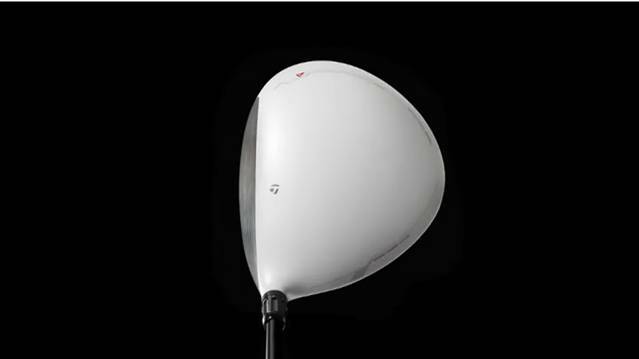 If you're a golfer that complains about the weight of today's titanium driver, you may want to give this a look. Also, if your grips get worn on these clubs, you can replace them with any grip and it doesn't really effect the weight. But the drivers I hit the best was the Adams 9032LS with the Graphite Design shaft and the Callaway Diablo Octane Tour driver with a Diamana shaft in it. Both had 8.5* lofts that I just murdered. Again, Trackman would be a better way to figure out what is performing the best, but very impressed with both drivers. Scratch Golf - Scratch was not an exhibitor, but KBS had their EZ-1 and AR-1 irons there. I'm not a big fan of Cavity Back and the EZ-1 is practically a Game Improvement iron. Seemed like a solid set of irons. Couldn't really tell the difference in the 1018 carbon steel, but it didn't feel bad by any means. I would say that if you're looking to go with Scratch, you should do it because of their higher level of customization. Miura - Again, not an exhibitor, but plenty of shaft companies had their demo clubs there. They had their regular blade there. I have hit Miura before, but it was indoors and you can't really distinguish the feel of hitting an iron indoors, with range balls, off a mat and into a net. With that, Miura irons do feel really soft. I was surprised because when I hit them indoors before they felt okay, but they felt very nice outdoors. Ping - I just hit the Anser irons which are Ping's first ever forged set of irons. I wasn't in love with them, but they are much softer than any other Ping iron I've ever hit. I'm gunshy with Callaway equipment, but they really impressed me at Demo Day. Not only was the Diablo Octane impressive, so were the Razr X irons. Unfortunately they only had 1 demo club of the X-Prototype irons, and that was a 3-iron. Funny enough, I can't hit a GI 3, 4 or 5 iron more than 12 feet off the ground, but can flush blade long irons most of the time. Anyway, both the Razr X and X-Proto's are made from 1020 carbon steel and felt great. Wilson Staff - I hit the FG62's. Solid set of clubs, without question, but there were others I preferred. I was quite impressed with Taylor Made's new line of MB irons. Very nice look to them throughout the set. Sometimes MB style irons get too small and thin with the longer irons and too bulky with the shorter irons (never understood that). Taylor Made and Mizuno have done a really good job with the shapes of their iron heads. But I was actually more impressed with the new Tour Preferred MB's than Mizuno's MP-68 and the new Nike Pro V blades. Heavy Irons - These are some cavity back irons, but they had a nice feel to them as well. I think they may be onto something when it comes to the weighting of their clubs. There were some clear winners here for me today. Fourteen being one of them. They are made to what is the equivalent of 1025 carbon steel. Felt downright excellent. I liked their irons, although they were cavity backs and really dug their fairway woods as well. Mizuno MP-11 - I thought these were very nice as well. They do come with a stock Dynamic Gold Spinner shaft now. I was very impressed with these wedges as well, but they are made from cast. Not a lot going on here. Bettinardi had the best looking putters at Demo Day, but companies like Edel weren't there and I don't believe Scotty Cameron was there either. Bettinardi offers a lot of different options now, particularly offering a grooves on the faces and stuff like that. I'll post up some pics later this weekend and show what I mean. Nickel Putter - I thought they had some good 'weird mallet' putter design company. They do have an interesting design that allows the golfer to pickup the ball and place their ball mark without having to bend over. Interesting concept. May not work for a lot of golfers who would prefer to play with name golf balls. 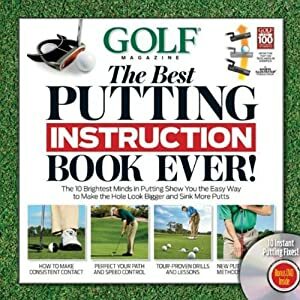 But for the golfer who plays every weekend and hates losing balls, it could be useful. Neat idea nonetheless. TourStriker - The TourStriker was probably the most popular item of any of the training aids I saw. The tee was constantly full and with people in line to try it out. George Hunt, John Dochety and myself all tried it out the Pro version. George and John hit it well. I flushed my first one and then struggled, but started flushing it again (I was using the 5-iron). Not an easy club to hit. I have a problem where I backup out of it in the downswing. Part of that is caused by me not unfolding the right arm enough in the downswing, so I turn the shoulders very upright in order to get the club to the ball. Very difficult to do with the Tourstriker Pro. I then started to get that down and afterwards I was hitting the ball great with your regular clubs. Martin let me test drive a new training aid he has, so I'll give a review on that soon as well. There was nothing really on mats except for outdoors mats. I'll look into those tomorrow. Right now, I'm beat. Walked around quite a bit, hit a lot of balls, asked a lot of questions and it was about 30 mph wind, which just makes you dehyrdate more quickly and tire easier. One of the things that gets debated about equipment is the evolution of the Mizuno line of muscleback blade irons. One of the arguments debates if Hogan equipment influenced Mizuno's design of their irons. First, let’s take a look at some Hogan irons. 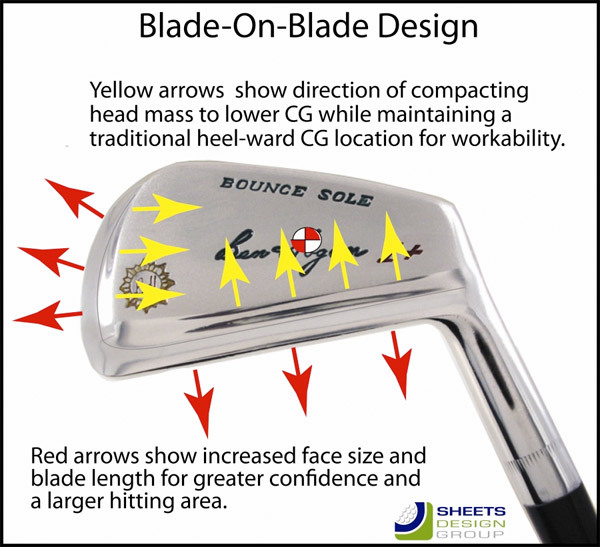 Check out this link on how Sheets Design Group went about making the 1999 Hogan Apex Model. 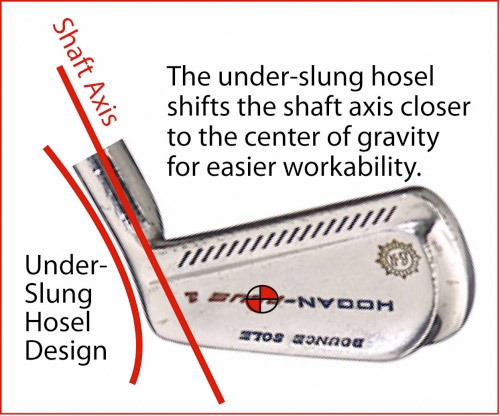 One of the first things Sheets Design Group mentions is how Hogan preferred what he called an ‘underslung hosel.’ Hogan believed that the underslung hosel shifted the shaft’s axis closer to the sweetspot which made it easier to work the ball. Next, Hogan liked what he called a ‘blade on blade’ design. As you can see…’underslung hosel’ with a ‘blade on blade’ design. Let’s fast forward to 1983. Hogan came up with an alternate design of irons called the “Personal” irons set. As you will see, there’s no ‘underslung hosel’ and no ‘blade on blade’ design. However, after that the Hogan company started to eliminate the ‘underslung hosel’, but still kept the blade on blade design. Here’s a look at the Hogan ‘BH Grind’ iron which was made in 1990. As you can see, no underslung hose, but the blade on blade design is there. In 1987 though, Mizuno company started a line of irons called the Mizuno Pro TN-87. This was a limited set of irons that were designed by Tommy Nakijima in ’87, hence the name TN – 87. As you can see, they practically look identical. Personally I believe Nakijima probably had a set of Hogan Personal irons and liked them so much that he decided to design the TN-87’s after them. The success of the TN-87 eventually led to the MP-29’s which were an instant success and then the MP-14’s, which became extremely popular stateside. As you can see, the MP-29’s have a similar design to the TN-87 and the Hogan Personal. Good video on the man and his swing. I prefer the hit and run, some prefer Compton style. I get asked sometimes as to why I think understanding D-Plane is so important because I’ve played golf well without understanding D-Plane, so why does this knowledge matter? Usually the complaint I get against D-Plane is that with the old ball flight laws (ball starts on initial direction to the path and then curves depending if the face is closed or open to the path) have worked for golfers. Jack Nicklaus prescribed if you want to hit a draw, have the face closed at address and take your normal stance and swing. If you want to hit a fade, open the face at address and take your normal swing. This, if done exactly as prescribed, will get the golfer to hit a draw or a fade. So there is some truth to it. But to have a shot that draws or fades back to the target, the golfer has to do some manipulation of the clubface in order to get the ball to start where it needs to go so it can curve back to the target. In Nicklaus’ prescription, if he kept the face closed at impact like it was at address, the ball would start left of the target and then hook even more left. One of the great joys of understanding D-Plane though is in the duck hook. Y’know…that shot that starts left and goes about 3 feet off the ground and hooks. According to the ‘old ball flight laws’, the golfer simply ‘came over the top of it’ because the ball initially starts left, so the path had to be going left as well. The golfer can hit a duck hook with a DEAD PERFECT SQUARE PATH. If the face is at 7* closed and the path is square, D-Plane says the ball will start left and even though the path is square to the target, it is 7* inside-to-out with relation to the *face*. Thus, the ball starts left (7* closed face) and hooks even further left (path is 7* inside-to-out with relation to the face). And because the face has been hooded, this de-lofts the face and that’s why duck hooks go low. And that’s important to understand because if you’re hitting a duck hook, the old ball flight laws prescription is to ‘swing out to the right’ because you’re obviously ‘coming over the top.’ But the reality is that the path may be perfect and the face is screwing things up. Thus, when a golfer with a dead perfect path is now being told to ‘swing out to right field’, they are now even more likely to hook the ball. Obviously, there’s more to D-Plane than understanding that you may hit a duck hook with a perfect path. But if you can start to understand D-Plane, your efforts to troubleshoot problems will become much easier. For my money, that belongs to European Tour player Steven O'Hara. Take a look at this action. If you combine total driving + GIR rank, O'Hara finished first on the Euro Tour...and it's easy to see why. Here's a video from 3Jack Top 50 Instructor, Shawn Clement, on hitting bunker shots from buried lies. I've been asked over time about why I don't do posts on the 1 plane swing theory. A lot of the theory I'm not a big fan of and I don't like how some of it is represented. However, it's always good to know what people are teaching and thinking. The idea is that a 2 plane swing will have to make the compensation of getting the left arm below the shoulders again to get the club on plane in the downswing. With the 1 plane swing, no compensation is necessary. So, if you have some troubles with coming over the top, you may want to look at getting your left arm parallel to your shoulder plane at the top of the swing. Here's an ole David Orr video discussing the dynamic profiles of putting. Looked at some of these stats today and I thought they were interesting. So why is he almost never mentioned as one of the all-time great ballstrikers? 2. He was a very good to excellent putter. I think this may add to some theory with some people that Nicklaus was a ‘bomb-n-gouge’ type of player. Which he really was not. 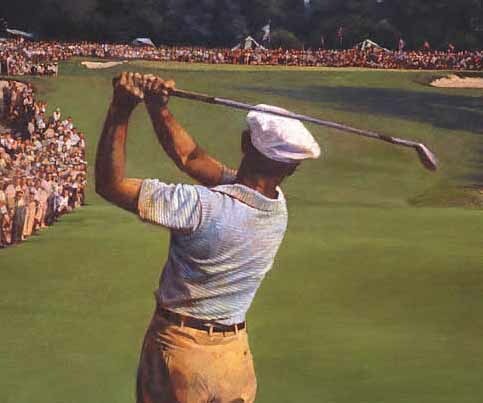 He was the greatest driver of the golf ball in the history of the game as he hit it long and accurately and was quite good with most of his clubs in the bag. 3. He was known for not having a stellar wedge game. Ballstrikers are supposed to have great wedge games. Of course, I don’t think it matters when he hits it 50 yards past your and he’s using a wedge and you’re using a 7-iron. My guess is that in his prime, his ballstriking was far superior to most of the field. He did play some tournaments that Ben Hogan was also playing in, but I think Nicklaus probably out-drove him by a good amount and Hogan probably was far better with the wedges and was, at the time, far better with course management. From what I have gathered, it’s geared towards optimization. It seems like his panel of experts prefer in optimization as well. With regards to golf, optimization means to me to be able to hit the best possible golf shot. I believe that most of the time, the optimal shot is a straight shot. Now, playing a draw or a fade is something that golfers tend to feel they can rely on more, but I think *most* of the time, if one could count on hitting it dead straight. In other words, my interpretation of ‘optimization’ is if Jimmy Jack typically hits his driver 250 yards long with a draw, but had the potential to hit it 325 yards long…if he ‘optimized’ his swing he would be able to hit it 325 yards long and dead straight quite often. Precision basically means ‘consistency.’ However, it doesn’t quite mean ‘accuracy.’ If I hit 10 shots and all 10 shots miss the target by 50 yards but are within a small grouping of each other, that is still ‘precise.’ It’s just not accurate. So when I think of a golfer with a precision/accurate swing that is not optimized, we would say that Jimmy Jack has the potential to hit it 325 yards, but he hits it the most consistently accurate when he hits it 250 yards. One method of ‘optimizing’ the driver is to change your Angle of Attack. If a golfer takes the same swing, but changes the Angle of Attack, that will typically cause differences in distance. A great example of this happened this past year with PGA Tour players John Senden and Troy Matteson. According to PGATour.com, both Senden and Matteson averaged the same clubhead speed with the driver throughout the year (116.9 mph). However, Matteson averaged 296.3 yards off the tee (ranking 22nd) and Senden averaged 290.2 yards off the tee (ranking 72nd). That’s a difference in 50 ranking points in driving distance despite having the same clubhead speed. The big difference between Matteson and Senden is the launch angle of their drives. According to PGATour.com, Matteson’s avg. launch angle in 2010 was 11.1*. Senden’s was 8.9*. This allowed Matteson to carry the ball further. PGATour.com does not have attack angle stats on hand for their players, but I would assume that Troy Matteson has a shallower attack angle than Senden’s (and probably an upward attack angle) as Matteson uses a Titleist driver with 8.5* of loft and Senden uses a Titleist driver with 9.5* loft, yet Matteson’s launch angle is 2.1* higher than Senden’s. However, Matteson finished hitting 60.4% of his fairways in 2010 (ranking 142nd) vs. Senden hitting 67.2% of his fairways (finishing 46th). Awhile ago Slate.com posted an article on ‘Moneygolf’ (http://smartpei.typepad.com/robert_patersons_weblog/moneyball.jpg), a statistical method to more accurately depict a PGA Tour golfer’s skill set as it pertains to the rest of the PGA Tour. One of the things discussed in the article is that the majority of the time, the golfers who are the best from 175-250 yards out typically do the best over the season. Essentially, the golfer who can get the golf ball closest to the hole consistently from that distance will likely do the best over time. Here’s where the debate happens. This does NOT mean that accuracy/precision is the way to go. Just because you’re typically accurate and precise throughout a round of golf, doesn’t mean you’re accurate and precise from 175-250 yards. Because it’s typically easier to be more accurate when you’re hitting less club. Let’s say Dustin Johnson has a 7-iron in his hand from 210 yards out and Omar Uresti has a 4-iron from 210 yards out, chances are Uresti is going to have his work cut out for him. And remember, they may have very tough lies, lie a downhiller with water in front. Personally, I’d prefer to go into that green with a 7-iron if I could than a 4-iron. Also, distance off the tee plays a factor. Let’s say Uresti and Johnson are playing a 520 yard par-5. Uresti could bust a 280 yard driver and have 240 yards in. Johnson could bust a 350 yard driver and have 180 yards in. And now Uresti might be hitting a 3-wood into the green whereas Johnson is using a 7-iron. Anyway, here’s the top 20 players in the world now according to the Sony World Rankings. I’ve put their driving distance in 2010 and their rank next to them. In the end I think it’s really a case of the ‘optimizers’ striving to add precision with their optimization and the ‘precision/accuracy’ golfers trying to add some optimization to their game. On the forum (http://richie3jack.proboards.com) there was some discussion about the unfair advantage the PGA Tour players get vs. Joe Amateur get in tournaments. I decided to run thru my main gripes. It’s funny how the PGA Tour will go to lift, clean and drop at the drop of a hat, yet your typical amateur tournament will need an act of Congress to institute this rule. Years ago at the old PGA Tour stop BC Open, I saw Chris Dimarco ask for and get relief from casual water. I thought this was strange since it had been almost a week since the last time it rained and after the shot I walked over the spot (he was near the ropes) and I think at the very worst it was lightly moist. Contrast that with years of playing in tournaments where I’ve seen literally every level of precipitation possible, even to the point where the crew is using squeegees on the green during tournament play and the officials decide to only allow the golf to lift clean and drop if they are plugged and if it’s in the fairway. Sometimes I laugh off the notion of course planning because the PGA Tour players are at a massive inherent advantage. For instance, they are told beforehand exactly where the pin placements will be for each day (in fact, they usually mark them with a small piece of spray paint during the practice rounds). Then the caddies can go out and map each green in its entirety and determine exactly how a putt will break from different positions on the green. In fact, it’s done so often that the veteran tour caddies no longer have to map many of the greens because they already mapped them years ago. Then there’s the yardage books which can just about give the precise distance to any spot on the course and are extensively detailed. These things are not prevalent in most amateur tournaments and since laser rangefinders with slope are disallowed in tournament play, the disadvantage is quite noticeable here. I play the ball down in regular rounds, but will find a divot whereas the pro tour seems to rarely find a divot in the fairway. And while PGA Tour golfers do generate great clubhead speed, it’s easier to hit the ball further when you get 50+ yards of roll on very firm and fast fairways versus getting 20 yards roll on thick and slow fairways. Anybody who has ever worked on a course knows that the one thing that the superintendent and crew loathe working on it’s the bunkers. Plus, if you’re playing in a tournament there’s a good chance that somebody may not rake the bunker. This is a tricky situation because the rule is an important rule. But when somebody hits a shot that should be findable and playable and they cannot find it, that’s a tough break. Particularly when on the PGA Tour they can hit a far worse shot into the middle of nowhere and have a spotter and fans find the ball for them. Perhaps the debate and theorizing of Ben Hogan’s ‘Secret’ has the most legs of any topic in the realm of internet golf swing analysis. I think we’ve just about heard it all, from the sublime to the entirely possible. From pre-torqueing the foot at address to cupping the left wrist at the top of the swing to an alleged reverse pivot. For me, it’s gotten to the point as to whether or not I really question if there was a ‘secret.’ You see, golf pros generally didn’t make a ton of money in those days and if you won a major, you probably were not set for life. There definitely could have been a monetary motive for Hogan cryptically discussing a ‘secret’ when there really wasn’t one in order to draw in the masses and make money off of them. Plus, Hogan changed what was the supposed ‘secret’ so many times that I lost count. That being said, I do believe that Hogan had a ‘Secret.’ However, it was a secret that in particular worked for him and may not work for everybody else. It’s like Homer Kelley preached over and over with The Golfing Machine, there is no one way, but there is a best way for each individual golfer. Thus, what worked for Hogan probably would not work for a lot of other golfers in the world. In fact, it was probably a case of Hogan finally seeing that he eliminated the hook thru a certain set of mechanics he had and then grasping what those mechanics felt like to him. But as I’ve preached on this blog, the feel is often ‘not real’ and a feel that works for one golfer typically will not work well for another golfer. When it comes to investigating and analyzing scenarios like this, I like to break down things and figure out the facts first. What do we know about hitting hooks? Typically, the face is too closed at impact and thus any path winds up becoming inside-to-out with relation to the face. For instance, if I have a face that is closed to the target by -5* and a path that is outside-to-in with relation to the target by -2*, that will still result in a hook because the path is actually inside-to-out with relation to the face by 3*. The other way to hit a hook is to have a very inside-to-out path. That begs the question, was Hogan a golfer that struggled with a closed clubface or a path that was too far inside-to-out? I tend to believe that the closed clubface is the problem. As he said in interviews, his hooks were so bad that he couldn’t get the ball up in the air and he couldn’t hit it high on command. What we know about a hooded face at impact is that it de-lofts the club. That’s why snap hooks go low, the face is closed and the club is now de-lofted. I conclude that at a very basic level, Hogan’s ‘secret’ was that he figured out a way to prevent the clubface from getting too closed at impact. Thus, my guess is that he learned to utilize the CP Release. Of course, this is filmed from the caddy view instead of the DTL view, so we cannot clearly distinguish what type of release he was using and what the closure rate was looking like. But from this view it’s very clear to me that his arms ‘crossover’ much more quickly after impact than they do in this later ‘post-secret’ swing sequence. If I had to guess, Hogan was utilizing a CF release and a horizontal hinge action in the YouTube video. We know that ‘post-secret’ he was utilizing a CP release. Thus, with the CP release the handle got lower and the rate of closure slowed down. And for Hogan it probably slowed wayyy down. Do I believe that the secret was ‘cupping his left wrist’ at the top of the swing? He may have very well done that. Hogan had a weak grip, something that would actually make it more difficult to keep a slow rate of closure. Hogan probably had ultra strong hands in order to CP release with such a weak grip, but he probably needed some extra help in preventing that clubface from turning over as well. Now, I think other things helped him as well. I think his idea to make his shafts ultra stiff probably helped him develop that great pivot he had which probably helped him better grasp how to CP Release. My guess is that Hogan probably thought to himself ‘If I don’t want to hit a hook, let’s try to feel like I’m hitting a slice on every shot’ or to that effect. And when he tried that, he probably started flushing lasers right at the target, shot after shot. If so, it reminds me a bit of Sandy Koufax who had one of the greatest fastballs in the history of the game, but couldn’t throw strikes because he tried to make batters whiff on every pitch. Eventually in a spring training game his catcher came out and said he should try and throw it slower so he can throw strikes and allow them to hit the ball, but at least he will stop walking batters. Koufax finally listened and ‘let them hit the ball’, except even when Koufax felt like he was throwing slow to let them hit the ball, he still threw it so fast that nobody could it him. Such a simple concept for Koufax that shows that the feel can often be completely and utterly false from reality. And I wouldn’t doubt if Hogan felt like he was trying to slice the ball off the grid and found himself hitting it flush right at the target. But it also shows that the ‘secret’ was probably just Hogan’s secret and it worked just for Hogan. Much like Koufax ‘let them hit the ball’ worked for Koufax.